IU East’s Homecoming Parade will be held November 2 in the Depot District. 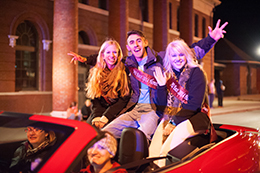 Indiana University East will host “Homecoming 2015: Students by Day, Red Wolves by Night” November 2-6. Alumni, friends and the campus community are invited to participate in activities and events throughout the week. Homecoming events are sponsored by the Alumni Association, Office of Campus Life, Student Activities Advisory Team, Student Government Association, Students Today Alumni Tomorrow, The Annex of Richmond, Square Donuts and G101.3. Homecoming 2015 begins at 11 a.m. on Monday, November 2, with Monday Madness. Students will enjoy free food and the Homecoming Court will be announced in the Springwood Hall Graf Center. Later that day, Red Wolves will participate in one of the most attended and popular student events of Homecoming Week: The Nearly Naked Mile. The seventh annual Nearly Naked Mile is at 1 p.m. with registration at 12:30 at the Springwood Hall patio. Sponsored by the IU East Alumni Association, the student event raises donations for those in need, so a registration “fee” of one or more gently used items of clothing (such as coats, hats, or gloves) is required. Prizes will be awarded for top Male and Female Finisher and also Best Costume. Later Monday, the community is invited to the Homecoming Parade at 6:30 p.m. held in Richmond’s Historic Depot District. The parade will travel Fort Wayne Avenue and feature campus schools, clubs and organizations as well as the Homecoming Court. Several community groups will join the parade including various bands and mascots from the region. A parade tailgating party for campus participants will be held at 5 p.m. Following the parade, join IU East for the Rufus After Party at 7:30 p.m. at Richmond Furniture Gallery parking lot. On Tuesday, November 3, just before the tipoff for the men’s and women’s basketball game double-header, IU East students are invited to Howl Crowd 101 beginning at 5:30 p.m. at the Richmond High School Tiernan Center. Join the student section and become a Howl Crowd VIP. Students receive a free Howl Crowd shirt and pizza. The men’s game starts at 6 p.m. at the Tiernan Center versus Madonna University while the women’s team will play Wilberforce University at approximately 8 p.m. Rufus’ Birthday Party will be held during half time of the men’s game. Homecoming court will be presented in between the men’s and women’s games. On Wednesday, November 4, IU East students are invited to see Hypnotist Dan Lornitis at 8 p.m. in Vivian Auditorium. Lornitis is a comedy hypnotist par excellence. He’s been mesmerizing audiences for years with his uniquely entertaining performance, where the audience volunteers are the stars! Lornitis uses hypnosis to entertain, never to embarrass or humiliate anyone. It’s all good, wholesome, PG13-style entertainment. Students are admitted free with their Wolf Card. On Thursday, November 5, is National Donut Day. Students receive free donuts, available in each building beginning at 9 a.m. courtesy of Square Donuts. The Homecoming Talent Show will be held at 5:30 p.m. in Vivian Auditorium and will feature student acts. Students, faculty, adjuncts, staff and alumni are welcome to attend. Then at 7:30 p.m. IU East’s Student and Alumni Bonfire will be held behind Hayes Hall, located near the patio. Students, faculty, adjuncts, staff and alumni are welcome to attend. The Homecoming King and Queen will be crowned at the bonfire. The 2015 IU East Chancellor’s Medallion Dinner is hosted to recognize the achievements of our three award winners. The dinner will be held at 5:30 p.m. on Friday, November 6, at Forest Hills Country Club, located at 2169 S. 23rd St., Richmond, Ind. The Chancellor’s Medallion Dinner will toast Garry Kleer, John McBride and Donna Spears as they are presented the Chancellor’s Medallion. IU East will also celebrate new inductees to the Alumni Hall of Fame. RSVP is required for this event. Contact Contact Angie Callahan at 765-973-8604 or visit iue.edu/chancellor/medallion/. Tickets are $75 each. For more information about Homecoming, visit iue.edu/homecoming. For a list of all IU East events, visit iue.edu/events. IU East Student Event. Free t-shirts, food and Homecoming Court announcement. IU East Student Event. Donate clothing and run/walk NEARLY naked. Alumni, campus and community invited to attend. IU East student event. Free pizza and t-shirts. IU East student event. Wolf Card required. IU East students and alumni are invited to the homecoming bonfire. Homecoming King and Queen will be crowned. Cost to Attend: $75 per person. For more information or to RSVP, contact Angie Callahan at 765-973-8604 or visit iue.edu/chancellor/medallion/.